U.S. Coast Guard 17th District Alaska Nov 5, 2018. A Coast Guard Air Station Sitka MH-60 Jayhawk helicopter aircrew rescues two stranded miners on the Chilkat River, 23 miles from Haines, Alaska, Nov. 3. U.S. Coast Guard photo by Lt. Kellen Browne. KODIAK, Alaska – A Coast Guard Air Station Sitka MH-60 Jayhawk helicopter aircrew rescued two stranded, hypothermic mine workers on the Tsirku River, off the Chilkat River, 23 miles North of Haines, Alaska, Saturday. The Jayhawk aircrew safely transferred the men to awaiting emergency medical services personnel in Juneau. The men were reported to have been mildly hypothermic upon transfer to higher care. Watchstanders at District 17 command center received notification from Alaska State Troopers requesting assistance with rescuing two male miners in the Chilkat River area. They were transferring mining equipment when they swamped and submerged their vehicle in a remote portion of the site. They were reported to have been hypothermic, as they became stranded Friday afternoon at approximately 2:30 p.m. They were reported to have made a make-shift shelter in a ditch approximately 250 yards from the water, but were experiencing difficulties maintaining their fire. 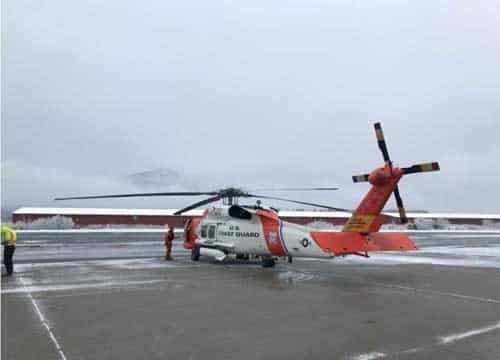 District granted an Air Station Sitka MH-60 Jayhawk helicopter aircrew to assist. The aircrew launched and recovered the two men Saturday morning. Weather on scene had winds exceeding 20 mph, low temperatures with freezing conditions, and low visibility.